Babe Beast - Successful Winter & Summer Steelhead fly. This fly fishes with a lot of action and is very fluid in the water. 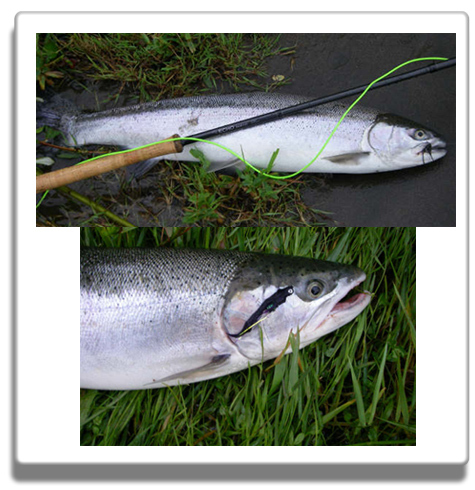 It has very good light reflecting qualities and late winter and summer steelhead slam this fly - solid takes! Fish larger sizes for winter, smaller for summer. Materials: HMH Plastic Tube, Petite Opalescent Black Estaz, Arizona Simi Seal, Schlappen Saddle Hackle, Straight cut rabbit strip, Krinkle Mirror flash, Ostrich or Rhea, Real-eyes plus 5/32 or Brass eyes.